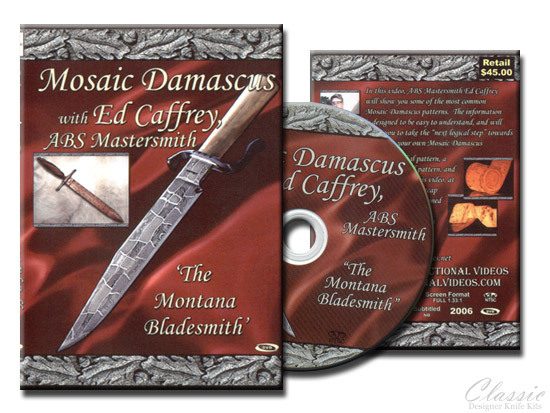 In this video, ABS Mastersmith Ed Caffrey will show you some of the most common Mosaic Damascus patterns. The information is designed to be easy to understand, and will allow you to take the "next logical step" towards producing your own Mosaic Damascus. Ed covers how to create a radial pattern, a basket weave pattern, a jelly roll pattern, and how to do an "accordion" fold. This video, at almost two hours, also provides a recap of tools, safety, and etching as explained in the previous two videos. If you're interested in how Mosaic Damascus is produced, this is the video for you. Our DVD's are DVD-R disc's. In order to view our DVD's, you must have a DVD-R compatible DVD player. Before you purchase our DVD's, please be sure that your DVD player is DVD-R compatible. If you are not sure about your DVD player, please visit DVD PLAYER GUIDE for a comprehensive list of current and older DVD players that are DVD-R compatible.